As October weather cools down, and it cools quickly in Vail, Colorado at 8,000 feet above sea level, local water temperatures correspondingly decline. 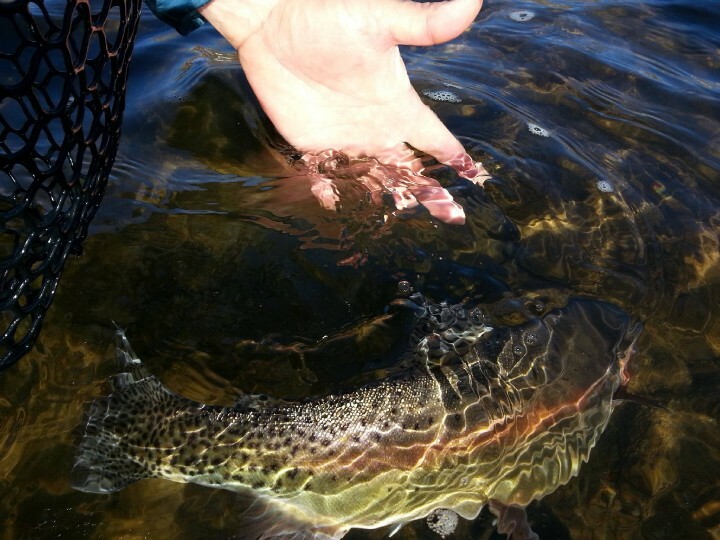 Descending water temperatures can help make fly fishing and fly selection a less complicated task during autumn. When fishing our local rivers like the Arkansas River, Blue River, Colorado River, Eagle River and Roaring Fork River the altitude will vary as much as 4,000 feet. Remember that what fly imitation may work upriver may not be similar to one working downstream but is a harbinger of what is coming. When looking at water temperature this time of year in the heart of the Rockies, early mornings can be below 40 degrees Fahrenheit which means not much bug activity. Maybe some midges are on the water since they tend to be the only hatch that is available to the fish throughout the winter. Trout usually prefer some more seasonal fare if it’s available. Enter the egg fly pattern, a mid-fall staple for Colorado trout. When the water is cool and no hatch is moving, the egg can be deadly. Fish the egg like a nymph with an indicator set a couple feet above the depth you intend to fish most frequently. Brown trout and whitefish are loading the water with reals eggs. In 1997 a size 22 chartreuse egg was all it took for me to land an IGFA world line class fly fishing record Kokanee but most anglers prefer a hook size 14 to 10. Color varies from pink to blue but some of my favorites are apricot, Oregon cheese and chartreuse. Advantages when nymph fishing with eggs; they work, you can use heavier tippet material and you can see the fly a good amount of your drift. Strikes are usually aggressive. Curved egg hooks hold trout very well. The egg works well throughout the colder months as a good attractor fly. Blue Winged-Olive Mayfly’s dominate the fall hatch here in Colorado and a fly I would not be without is some type of Beatis Emerger (BWO). The best sizes are from 18 to 22 and your tippet must match the fly for consistent success. Tippet sizes like 6X and 7X and soft presentations are required to hook trout in gin clear water. Try the sparkle grey RS-2 emerger or an olive WD-50 or the always effective Barr Emerger for a fool proof BWO emerger imitation. Fish the hatch deep at first and let your fly swing up from the bottom to invoke strikes. As you begin to view eager trout feeding just under the surface on emergers consider losing the indicator and weight while switching to a dry dropper rig. This will make it easier to position your fly closer to feeding brown and rainbow trout without disturbing the water. You will know when it is time to change flies when fish begin to tail and fin as they dine on emergers. My favorite dry in this type of situation is the Parachute Adams or some form of it like the Hi-Vis Adams or Foam Parachute Adams. They all will work with at least a nine foot leader and several feet of light tippet. Sizes 18 to 22 work but learn to examine the naturals carefully to best determine the exact size. Experience leads me to believe medium grey and not olive provides the best accent when hunting with a dry fly. If you find yourself fly fishing Central Colorado during the fall season keep it simple for trout success with eggs, blue winged olives and para-adams like imitations. 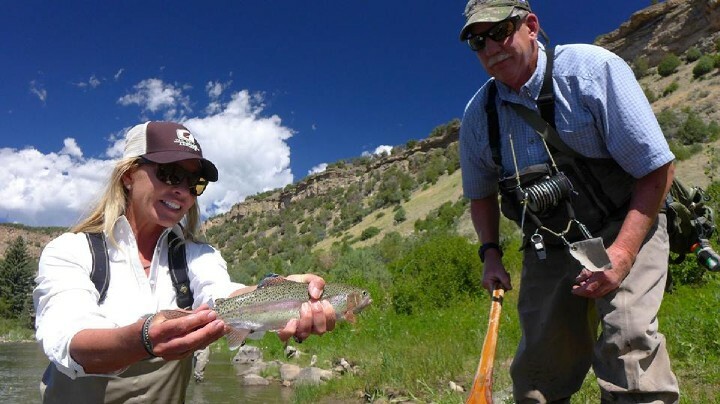 Should you have any questions or want to schedule a guided fly fishing excursion please don’t hesitate to contact Vail Valley Anglers (970) 926-0900, Edwards, Colorado. Next post What Kind of Fly Fishing Tools Do I Need?